Russ DiGilio, founder and owner of Duck Donuts Franchising Company, announces that the 12th North Carolina location will open in Jacksonville in May. "North Carolina is the site of our first-ever Duck Donuts location, so we are thrilled to continue our growth where the idea for our unique donut experience first took shape," says DiGilio. Duck Donuts Franchising Company announces its 12th North Carolina location: the Jacksonville Duck Donuts opens in May. North Carolina has always been a home away from home for our Duck Donuts team. It’s the site of our first-ever Duck Donuts location, so we are thrilled to continue our growth where the idea for our unique donut experience first took shape. Russ DiGilio, founder and owner of Duck Donuts Franchising Company, announces that the 12th North Carolina location will open in Jacksonville in May. 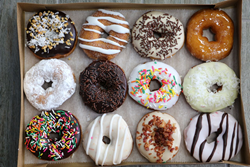 As the award-winning donut franchise expands its roots in the Tar Heel State where the Duck Donuts story first began, it brings the total franchise count to 37 open stores and 126 contracts. The Jacksonville ownership team consisting of Ed Gill, Mitch Johnson, John Guard, Peter Balent, and Amber Stallings Balent will debut their warm, delicious, made-to-order-donuts at 1092 Hampton Inn Way, in a new building located on popular thoroughfare Western Boulevard. Recognized as the Onslow County seat, Jacksonville is home to the United States Marine Corps Camp Lejeune and New River Air Station. It was also ranked by Forbes in 2014 as the fifth fastest-growing small city in the United States. Visitors and residents enjoy over 15 parks within the city limits, as well as the Lejeune Memorial Gardens. “We are honored to bring the Duck Donuts experience to such a beautiful city and to serve our great Marine Corps from Camp Lejeune,” says Balent. The Jacksonville store grand opening is scheduled for May 20, at 10:00 a.m. and features a ribbon-cutting ceremony that marks the official opening of the 2,100 square-foot shop. Which Duck Donut should the Jacksonville community should try first? “We’re all fans of the Maple Bacon donut, but you can’t go wrong with any of the toppings and flavors,” says the team. Donuts at this location will be made fresh to order 7 days a week, Monday–Thursday, 6:00 a.m. - 9:00 p.m., Friday—Saturday, 6:00 a.m. - 10:00 p.m., and Sunday, 7:00 a.m. - 9:00 p.m. For Grand Opening specials and donut topping updates, visit the Duck Donuts Jacksonville, NC Facebook page or connect on the web at DuckDonuts.com. As of May 3, 2017, Duck Donuts Franchising Company has 37 open stores and 126 contracts. By 2011, Duck Donuts had expanded to four Outer Banks locations and the donut business was so successful that DiGilio was continuously approached about franchise opportunities and by fans who begged for a Duck Donuts in their communities. The first franchise opened in Williamsburg, VA, in 2013, and there are now 37 open franchise locations and 126 contracts.